I have a bad habit of complaining about things. To work on this, I've been trying to consciously notice what I complain about and attempt to make a difference somehow. I used to complain about how homework wasn't accomplishing what I wanted it to. Instead of keeping to complain about it, I decided to do away with homework. I used to complain about how my students weren't taking their quiz retakes seriously. This year, I implemented an error analysis sheet that students had to fill out before they could retake a quiz. At the beginning of this week, I found myself complaining to my husband about something. And, the more I complained about it, the worse I felt. If you didn't realize it, this week is National Teacher Appreciation Week. 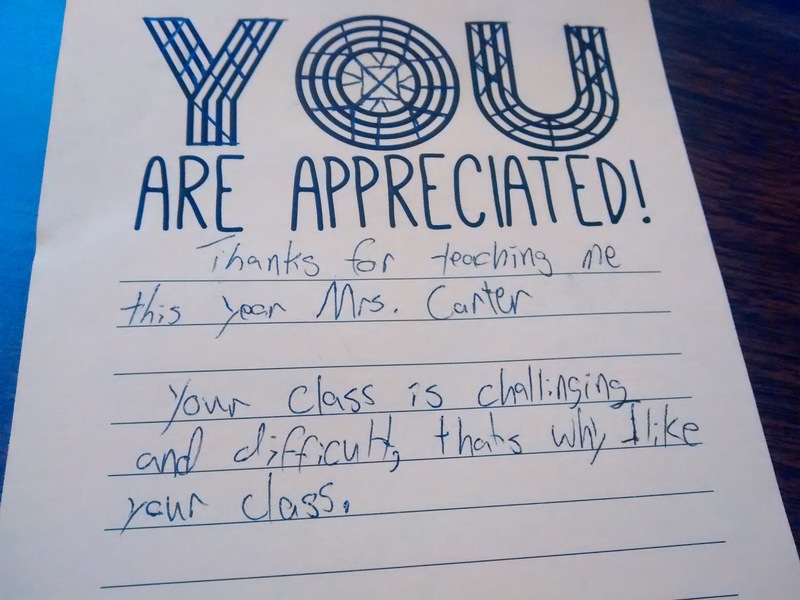 The only reason I knew this was that my twitter and facebook feeds were full of pictures of ways teachers were being appreciated by students, their parents, and their schools. So, I guess I was feeling jealous. This feeling went on for a couple of days until I realized that I could keep feeling depressed that no one had shown me their appreciation, or I could do something about it. Since school is almost out and testing has been over for a while, my focus in the classroom has turned to keeping my students busy with logic puzzles, origami, and make-up work. Yesterday, I decided to take action. 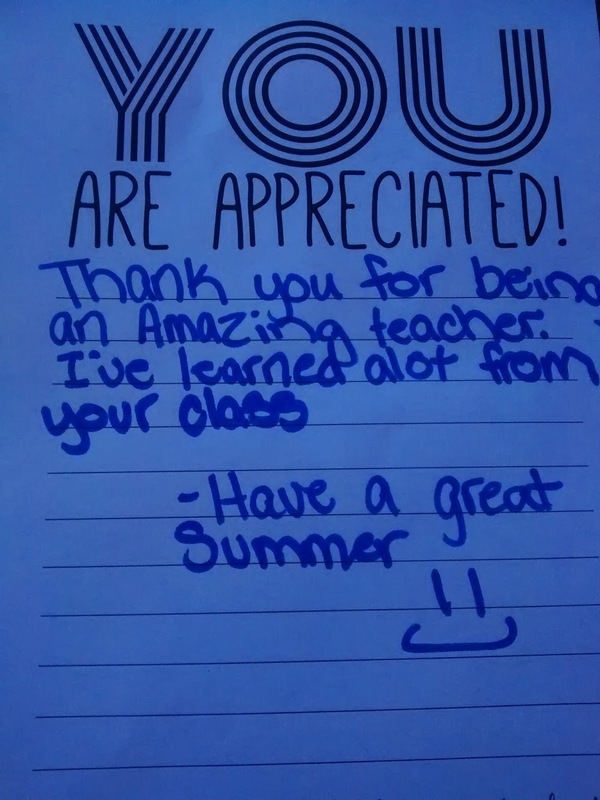 I couldn't ensure that I felt appreciated on Teacher Appreciation Week, but I could do something about how appreciated my fellow teachers felt. And, there's something so rewarding about helping make someone else's day. I designed a quick printable thank you note for my students to fill out and sign. I printed them two to a page on colorful paper. I had my student aide chop them in half and pass out one note to each student to write. I explained to my first group of students that it was teacher appreciation week, and I wanted them to write a note of appreciation to one of their teachers. I expected them to complain and grumble and ask if they really had to. But, much to my surprise, they seemed excited by the prospect. Though they had been given one note to write, students started asking for extras so they could write notes to additional teachers. Some of my students wrote a note to every single one of their teachers. They went above and beyond what I expected, and it filled my heart with joy to watch them be so excited to deliver their notes to the teachers they had written to. 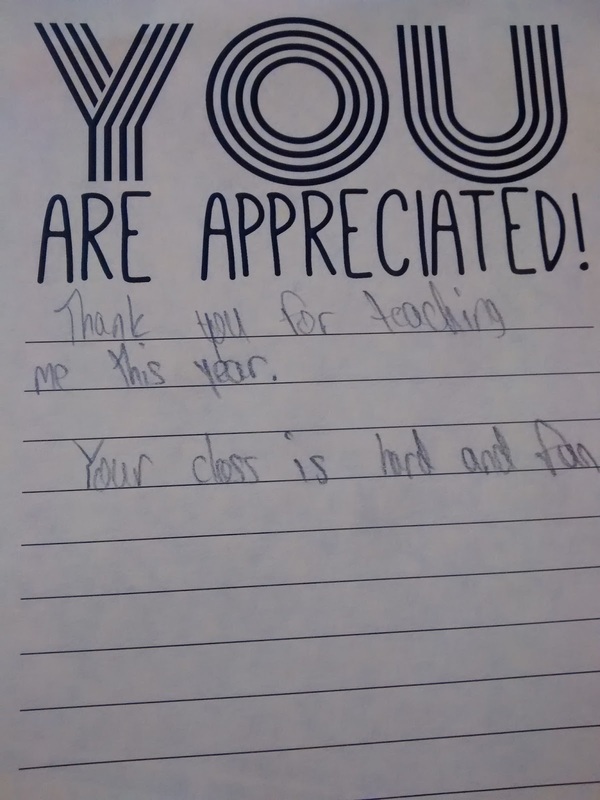 My kids may not come from affluent families that shower their teachers with gifts, but my kids are appreciative of the hard work their teachers do every single day. I'm so glad that I got past my bitter mood to give my students a chance to express their appreciation. Thanks for your post! I'm also having mixed feelings about Teacher Appreciation Week. I started out the week feeling unappreciated and a bit annoyed, but a few small gestures have made a big difference. I'm printing out your form to give my students as an option to do if they finish their work with extra time today. Yay for feeling appreciated! You are an inspiration to me, Nancy! Thank you! All any teacher wants is a little bit of thanks for all they do in and out of the classroom for their students. 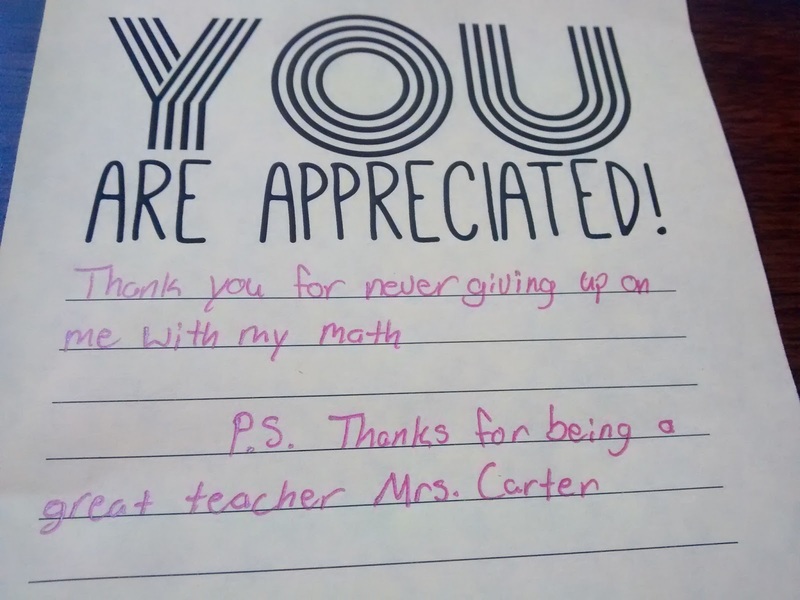 I will do the same and encourage students to write a Thank You to a teacher. I'm still getting over seeing "Mrs. Carter" instead of "Ms. Hagan. FUN FACT: I just binge-watched Freaks & Geeks on Netflix and there is a character named Millie that reminded me of you - not that I've never actually met you, but that actress' hair color and facial features are similar to what I've seen you post, plus she was sweet and nerdy and a mathlete - and when I looked up the info on IMDB it turns out that the actress is named Sarah Hagan! Anyway, Happy Teacher Appreciation, Mrs. Carter! That's too funny! Apparently, there's an actress named Sarah Carter, too. So, I'm curious as to how you did away with homework. Care to elaborate....? Pretty please? I am trying to transition to SBG as well, and I am struggling with the idea of NO homework...Do you have any tips? Or care to elaborate on how a day in your class goes with no homework? I am just worried that the students won't take it seriously when they don't have homework. Thank you! I absolutely LOVE your blog!